SLEEPCENTER proudly presents IN THE SHADE BUT NOT THE SHADOW, the debut solo exhibition of Ian Gouldstone. Assorted structures made from code and other objects are dispersed throughout the gallery. Some frantically wobble and spin, others gradually degrade only to regenerate again. These luminous shapes adhere to a simple set of actions that are repeated over and over. Following an ascetic aesthetic, Gouldstone imagines how we might design machines that can teach us grace, new technologies that enable meditation, reflection, and withdrawal. We take movement to be a sign of life; in both animations and simulations, movement is the reactive recognition of boundary conditions that suggests vitality. Several of Gouldstone’s structures are simulations, projection-mapped onto different surfaces to create new habitats for digital objects to occupy. Each subject varies in form, ranging from ambiguously animalistic to ambiently abstract. These works exploit aspects of our perception still wired in primordial ways, engendering inner sensations that point to future digital life and the turbid soup from which organic life emerged. The programs run forever, with slight deviations occurring over time, bringing attention to the ways digital images move. Rather than a series of predetermined events with a single outcome, these works emerge from basic input conditions, but whose output is in constant, infinite flux. For Gouldstone, infinity is a limitless expanse at a vanishing horizon, and the endless variation within chaotic-yet-contained processes. Video games use procedural generation to build an interconnected web of causal relations between variables, broadening the variety of events in the game world, and maximizing the number of possible things to do while playing. These gameworlds are grown not built. Technologies such as this exist behind an opaque complexity that actively resists easy comprehension. Conversely, Gouldstone’s structures stage their complexity at a threshold of understanding, simultaneously evoking richness but still imploring the viewer to discern their rules. Gouldstone liberates the digital from the prison-house of the conventional screen presentation, radically reorganizing our audiovisual experience in ways that privilege the nuanced interplay of color, light, shadow, and form. By distancing the conventional modes of computer engagement, the affective power of these technologies is revealed as a world of powerful abstract sensations. We’re prompted to reflect on the illusory and abstract nature of our own perceptions, extended into computer space. It is in the shade of computational visions that we see the elusiveness of consciousness reflected. The voice in our heads echoing in a biological void. Ian Gouldstone (http://iangouldstone.com/) is a BAFTA winning artist and filmmaker whose work incorporates games, animation and new media. 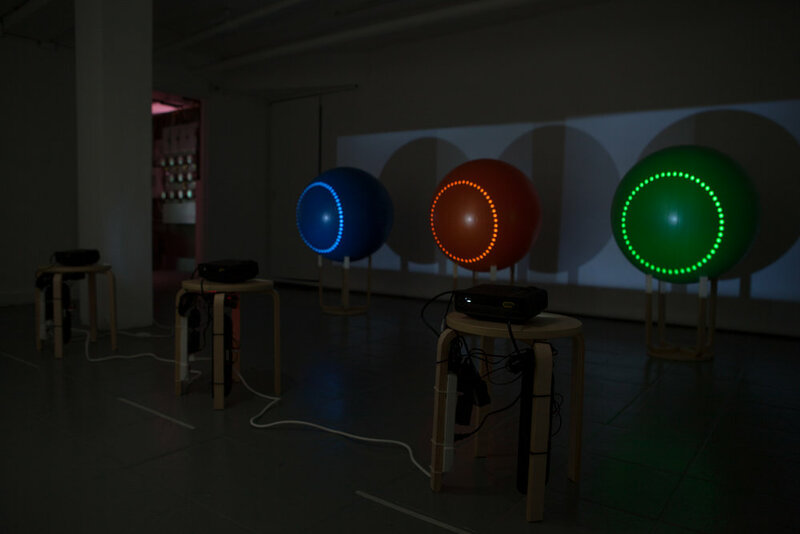 He has shown work and held events internationally at venues including the Institute of Contemporary Art, London, The Australian Centre for the Moving Image, Ars Electronica Linz, The National Videogame Arcade, Nottingham, and The Jozef Stefan Institute, Ljubljana. Gouldstone is a founder of the Australian games collective Pachinko Pictures, a former member of the Computational Creativity Group at Goldsmiths and also the Gesture and Narrative Language Group at the MIT Media Lab. He graduated from Harvard University with a degree in mathematics before studying animation at the Royal College of Art, and has recently completed his MFA in Fine Art at Goldsmiths. Based in southeast London, Ian Gouldstone is also a trustee of Deptford X, London’s longest-running contemporary art festival.